Long before the Bessemer process, steel was, and still is to some degree, made through bloomery furnace. 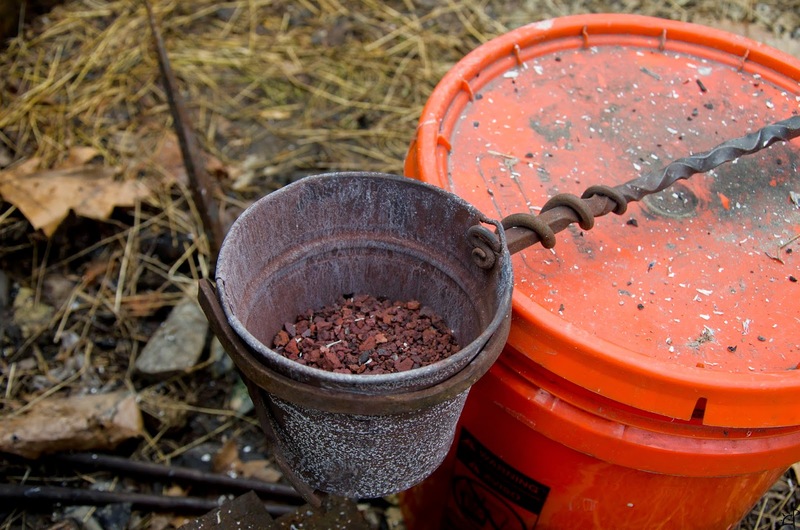 I had the pleasure of observing a smelt run by Jesus Hernandez and Dennis McAdams through which a mixture of crushed taconite ore and hematite in the form of iron sand. 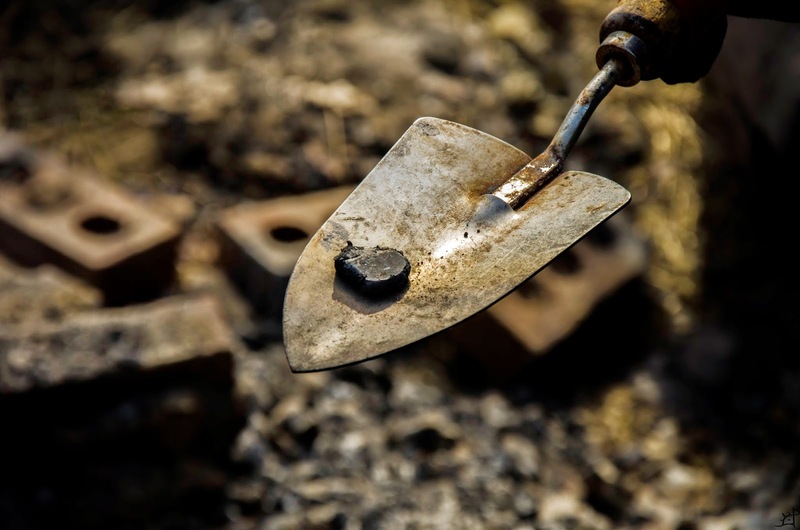 After the fashion of ancient ironworkers, the only fuel used in turning ore into steel is charcoal and oxygen. 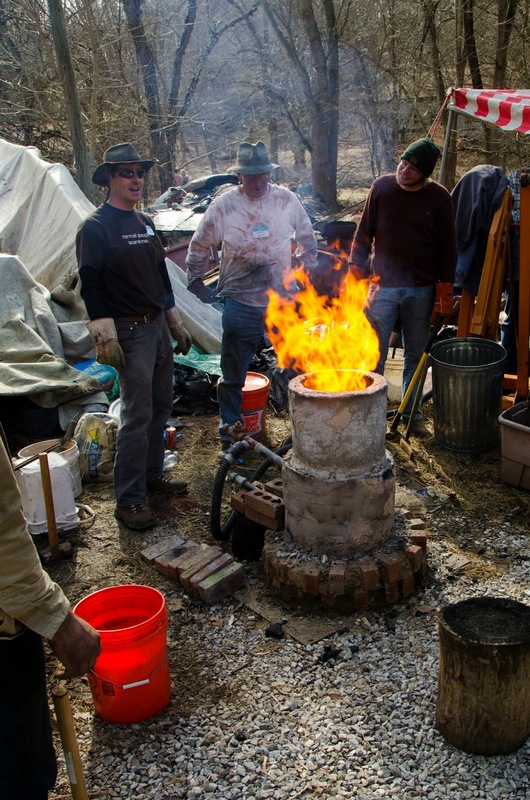 Lee Sauder has a more detailed view of the furnace construction on his website here. However, below the furnace is a slightly modified design using a three part construction, sectioning the stack into 'rings' that are placed one atop the next for a more preserving means of removing the bloom at the end of the smelt. A quick point of nomenclature. There are melts and smelts, both of which result in the creation of iron/steel/cast iron. 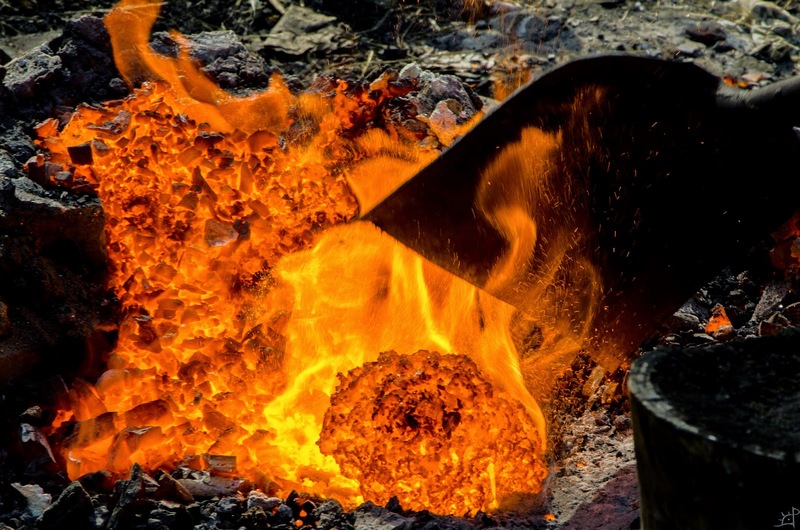 However, smelts are the process of turning ore into metal whereas melts condense or refine pre-existing metals into a reduced, consolidated, or carbonized form. By this definition, the recent post on hearth furnaces are melts, not smelts. 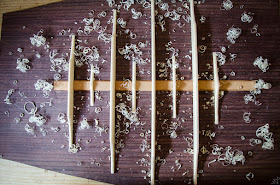 In the same line of thinking, bloom is only the product of a smelt, never a melt. Melts produce pucks or ingots (or similar words). Now that that is out of the way, here is a dance with the fire gods. Before the smelt can commence, the stack must first be pre-heated. This is usually done with brush, green wood, or anything that is not charcoal. The reason being is charcoal is more valuable than the generic fire wood. Also, green wood does not burn as hot as charcoal, so using it to bring the furnace up to temperature is a more efficient use of resources. The tuyere is also placed in a different location than it will be for the smelt. Notice the bricks on the right side of the stack. That is where it will later be moved to. It is on the front because that hole is lower, forcing the air up through every part of the furnace rather than coming in a few inches above the bottom (which allows for different chemistry inside the furnace). While the stack heats, the charcoal must be prepared. 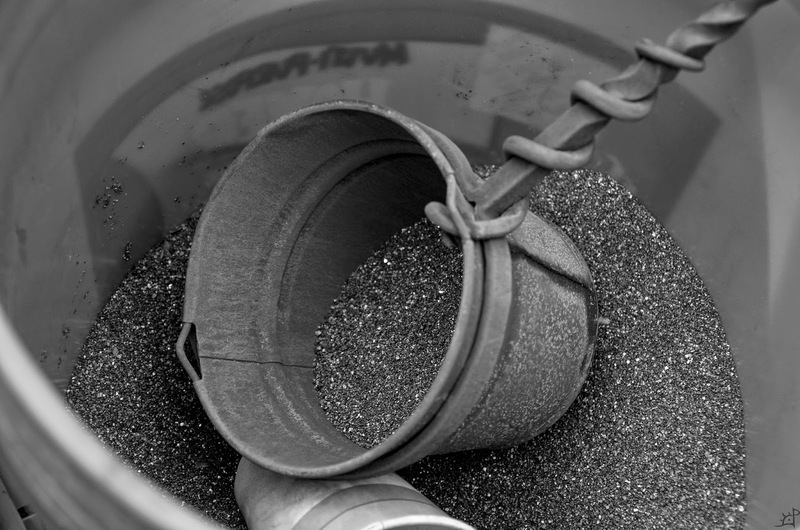 Much of the work in a smelt happens before/after the actual reduction of ore into steel. 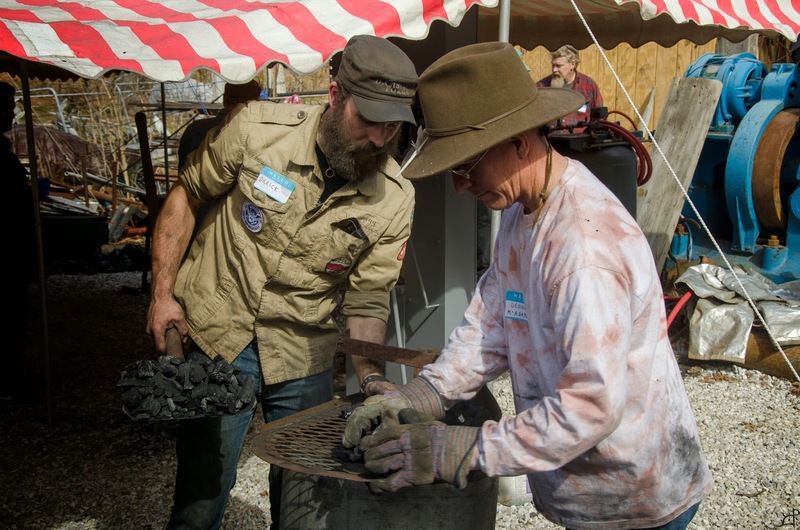 Here, Dennis and Derick break apart bags of hardwood lump charcoal into smaller, more consistent pieces. In addition to the charcoal, the ore must be prepared. To the left is the roasted, crushed ore. Only the first few charges were ore, the remainder being iron sand depicted below. The iron sand has also already been cleaned and sorted. While the prep commotion is happening, the ore charges are carefully measured and weighed, and sorted for the smelt. How much ore can be fed into the smelter depends on the size of the furnace amongst other things. With the addition of the tuyere window, it is easier to see if the bloom is growing or has stagnated, and if the slag needs to be tapped. Unfortunately (or fortunately, depending on how you see it), this smelt did not need to be tapped, as there was almost no slag at all. 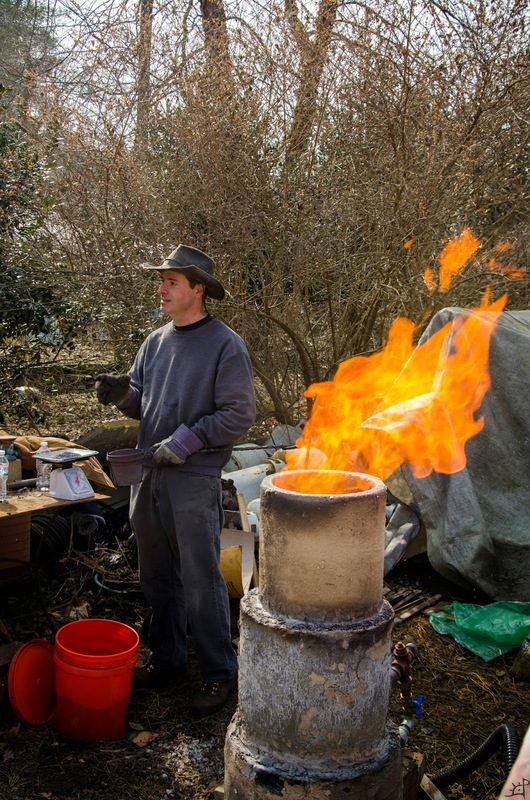 Throughout the duration of the smelt, 46 charges of ore went into the stack, each weighing in at 750g plus 4 or so at 500g each as the stack began to reach its capacity. A total of 36kg of ore was used. 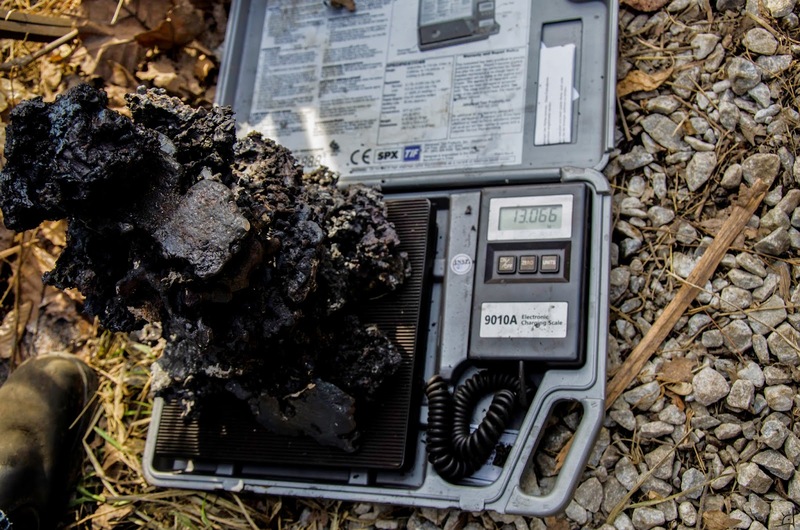 Paired with the ore, 1kg of charcoal in each charge made 50kg of fuel burned by the end of the smelt. When the furnace has been burning for a few hours, the tuyere is moved to the actual position and supported with brick, sealed with clay. Before the first charge of ore, everything is sealed as best as possible, patching any holes around the three pieces of the stack. 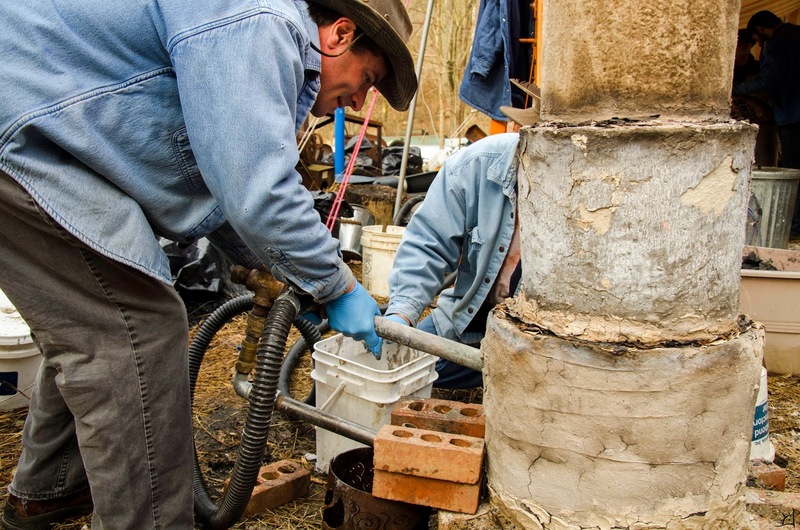 Jesus Hernandez, one of the leaders in bloomery experimentation and research, is weighing more of the iron sands and carefully recording the weights added and the time between each charge. Mixing the charcoal and whatever is being fed into the furnace to make bloom from ensures repeatability of results. Alternating layers of charcoal and ore/iron sand are added to the top of the stack whenever the level burns low enough to add another. As the charcoal burns down and the ore/iron sand heats, it liquefies and runs to the bottom of the stack, collecting carbon on the way. 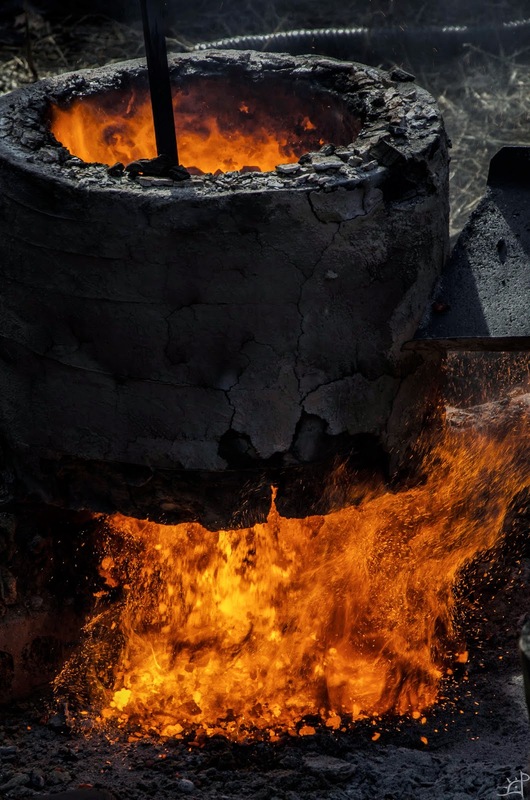 The depth of the stack, the time in the furnace after it reaches the bottom, and the heat at which it burns (the amount of oxygen pushed through the tuyere) are the three main contributing factors, and changing any of them can have dramatic differences in results. Keeping the time between charges constant helps eliminate part of this uncertainty. 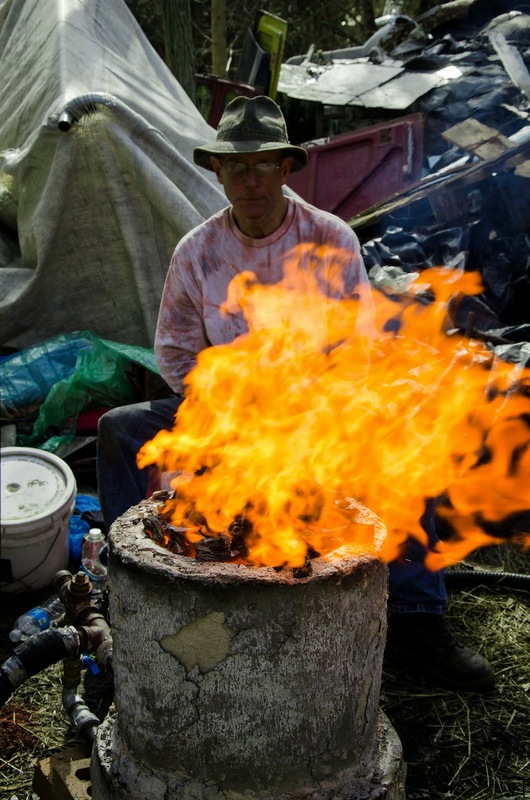 Dennis watches over the furnace as the charcoal burns down. For this type of furnace construction, the pieces can be removed sequentially. 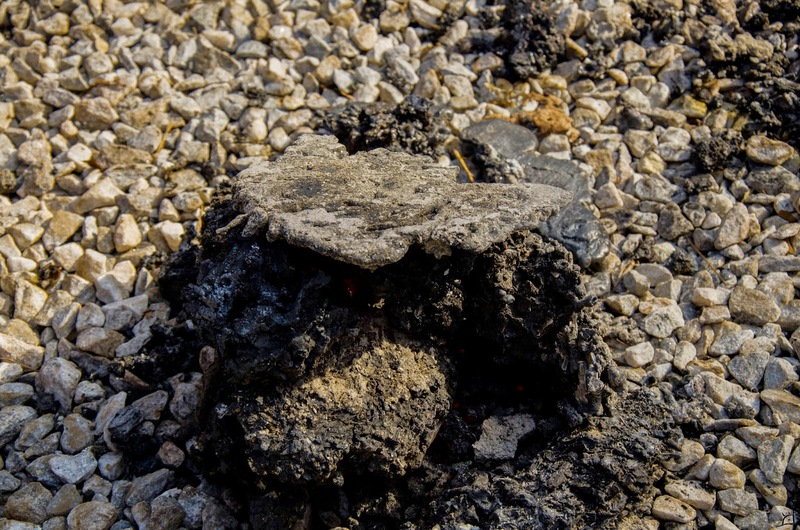 After the final charge of ore is introduced and the charcoal reaches the bottom of each section, it can be easily removed. This is important later when the bloom is removed from the stack. As the furnace nears the critical point where the bloom can be removed, everyone gathers around for the initial consolidation. 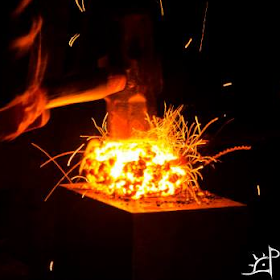 Hammering on the raw bloom helps break off slag, condense the relatively spongy structure of the steel, and reveal the character of the final product. Cast irons will be difficult to forge and crumble easily, while lower carbon steels will compact more readily. 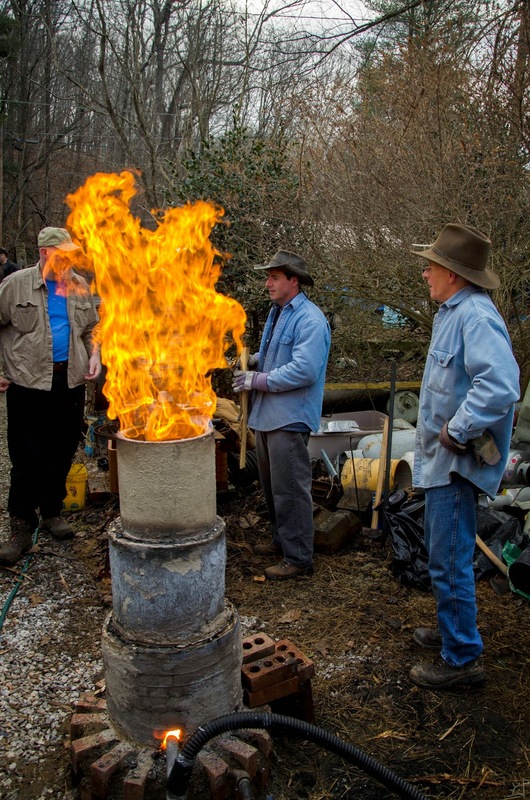 When the stack has burned low enough, the bricks of the plinth are pulled carefully away. Instead of breaking the walls of the furnace, this design allows for the bloom to be pulled from the bottom and the lower third of the stack to be lifted away. 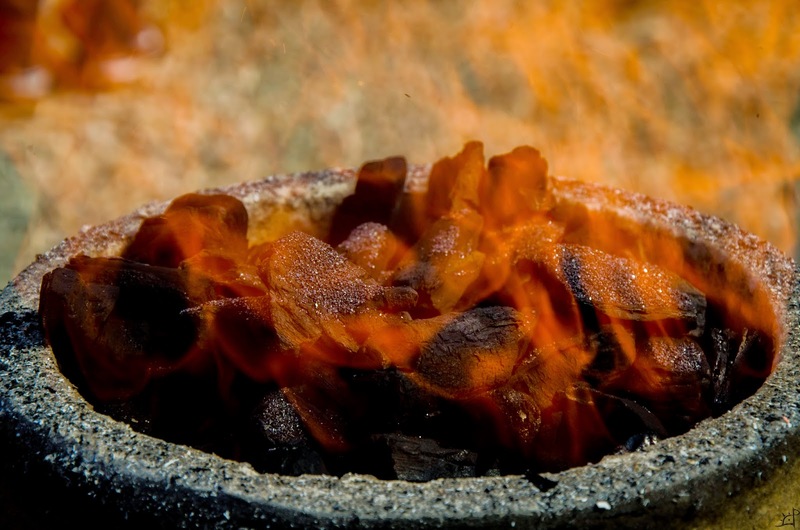 There is a critical moment when the last remaining coals flood out with the bloom in a deluge of fire. At night, this is a spectacular show rivalled only by tapping the slag that pours out in a winding river. Guided out by a shovel and lifted onto a stump for consolidation, the bloom sits like a meteor. Consolidation is an arduous process. Teams with sledge hammers and mauls strike like clockwork, compacting the unshapen mass into a more manageable shape. Bits of the bloom, faults and slag inclusions and regions of higher carbon content flake away, leaving behind a solid ancony (worked bloom). Through the consolidation, it was immediately obvious that the bloom was closer to cast iron than mid to high carbon steel. 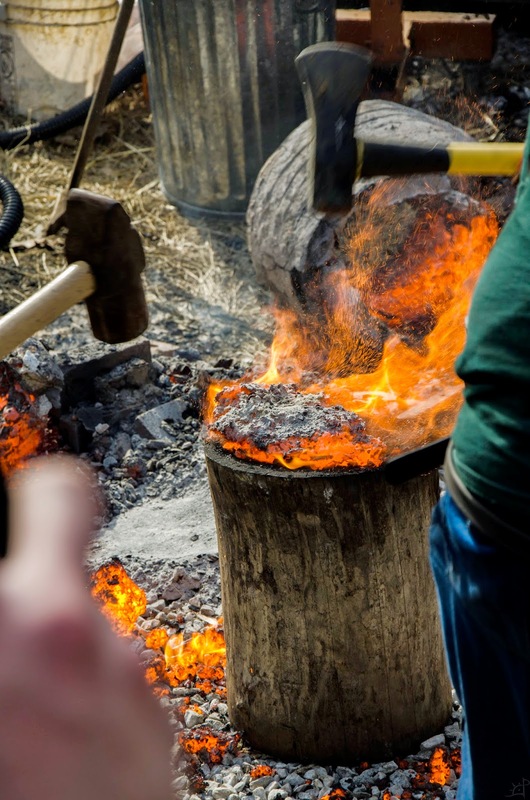 The large pieces cracked easily and were reluctant to forge without splitting. From large to small, most of the bloom showed consistent results. 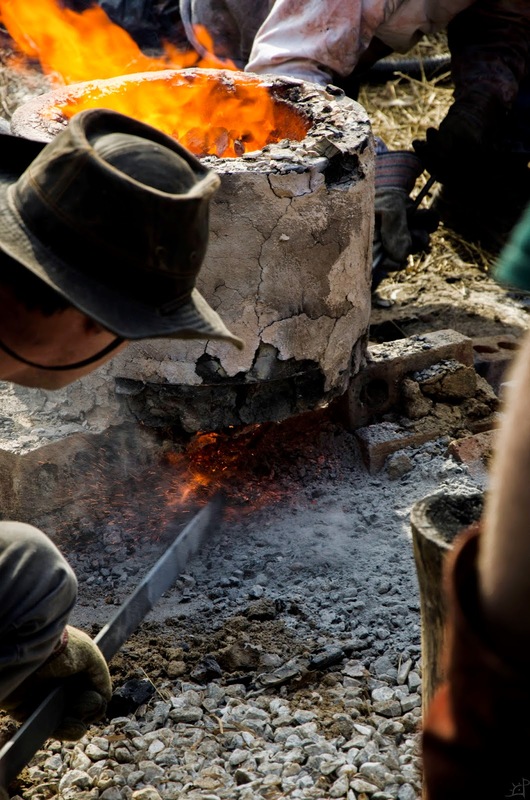 In all, the smelt yielded just over 13kg of bloom, an enormous amount of material for the size of the smelter. This was the product of over 25kg of ore and iron sand. 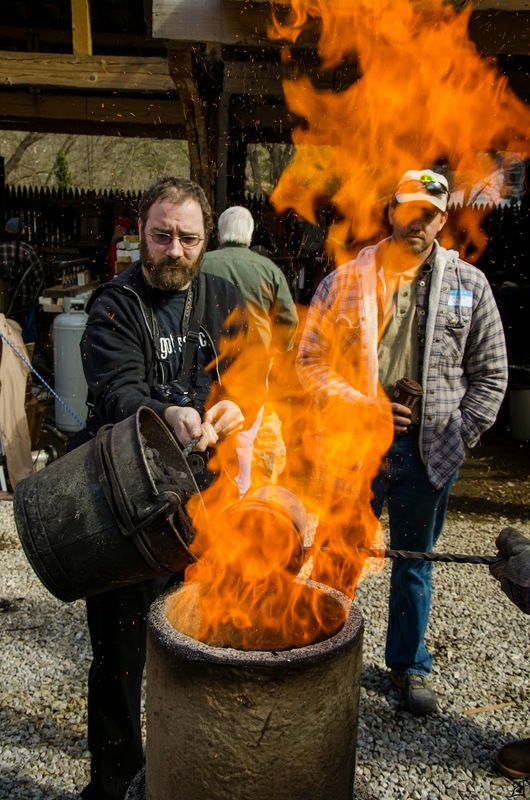 A quick spark test by Mark Green shows that it is indeed a cast iron bloom. 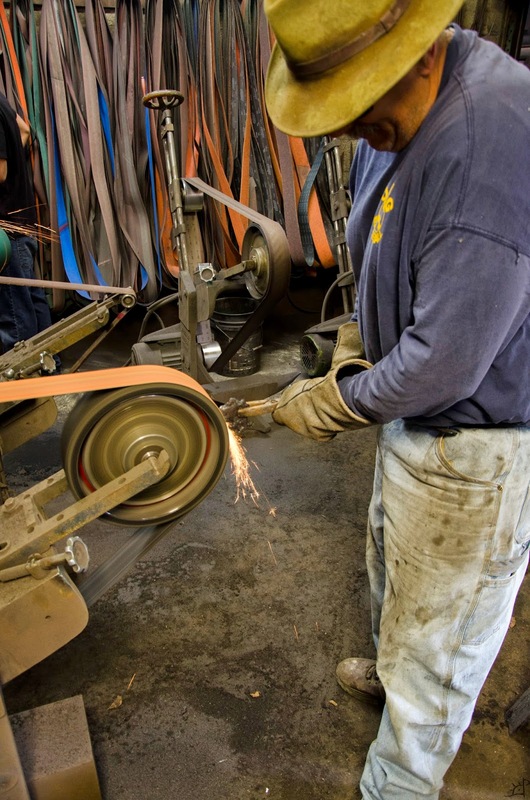 What will be done with it is anyone's guess, but it can be worked carefully as cast iron, or remelted and decarburized into a high carbon blade steel, used as contrasting layers for pattern welded steel, or a number of other things.